i Click 'view all' to instantly compare this ok deal with offers on other top toiletry bags & vanity cases for women. 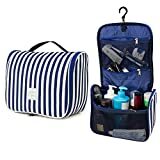 Bago Hanging Toiletry Bag for Women Travel Cosmetic Bag , Black is currently selling at $25.00, approximately $0.59 higher than average, giving a potential saving of $1.95 right now. With a lowest price of $21.96 and an average of $24.41 it is selling on the high end of its usual range. Price volatility is 0.45% (meaning it does not change often), so you might have to wait a while for the price to drop. Right now this product is a recommended 'ok deal'. There is a coupon available for an additional 10% off. 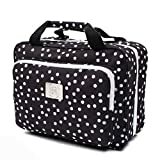 Compare the current price, savings (in dollars & percent) and Buy Ratings for the top Toiletry Bags & Vanity Cases For Women that are closely related to Bago Hanging Toiletry Bag for Women Travel Cosmetic Bag , Black. Here is how Bago Hanging Toiletry Bag for Women Travel Cosmetic Bag , Black compares with other leading Toiletry Bags & Vanity Cases for Women. ...your toiletries and accessories being all mixed up with your clothes? ...spilling and leaking accidents while traveling? ...poorly made travel bags that don't last the week? ...small size organizers that won't hold more than a couple of your personal items? We say enough is enough! It's time you got what you truly deserve and elevate your traveling to a comfortable and convenient experience every single time! 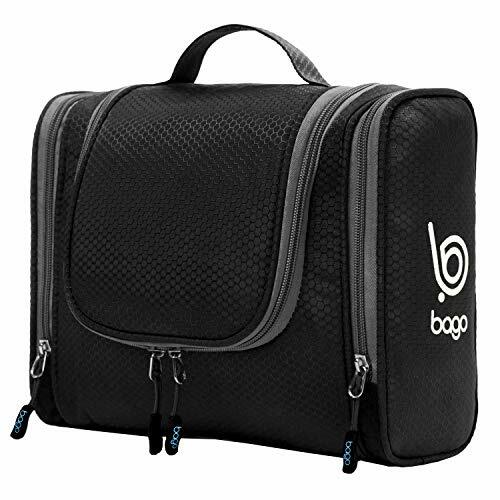 Presenting The Bago Travel Organizer Toiletry Bag For Men & Women! Our toiletry bag has only one mission; to allow you to stay organized and keep your travel essentials close by, at a finger's reach! Fusing roomycompartments with durable craftsmanship and a waterproof design, our cosmetic organizer will make your travel life 10 times easier! Plus, it comes in a variety of 7 colors to choose from, making it suitable for everyone. And did we mention it alsofeatures a hanging handle? Because it does! Hang it anywhere you go and save your valuable time and energy. What you're checking out is actually more than a toiletry bag. As long as your imagination is alive, you'll never run out of uses for this organizer! Use it as a lunch bag, a baby bag or gadget bag...Take it with you while camping, hitting the gym or any outdoor activities! Use it to store art supplies or important items! Jewelry, vanity mirrors, medicine and pills! So, Scroll Up, Click 'Add To Cart' And Travel In Ultimate Comfort! FeaturesALWAYS KEEP YOUR PERSONAL BELONGINGS ORGANIZED: If you are on the road traveling a lot, you know that between cosmetics and makeup, shaving kit, shampoos, combs, personal hygiene products and other small to medium-sized accessories, it can get pretty chaotic! Why not be 100% organized next time you travel with your very own hanging toiletry bag by Bago?ALL THE SPACE YOU MIGHT NEED -AND MORE: When it comes to travel essentials bags and organizers, size does matter! That's why our toiletry bag is spacious, compact and large enough to fit all your accessories and essentials from make-up and razors to shaving foam, toothbrush/paste, soaps, shampoos, jewelry and so much more! Keep everything organized in one place and you'll never misplace a thing again!DESTINED TO ACCOMPANY YOU FOR A LONG TIME: The Bagotraveling organizer is made exclusively with durable and lightweight Rip-Stop Honeycomb waterproof fabric that will protect your items inside. Each bag is durably stitched and equipped with heavy-duty zippers so that it becomes your most valued companion for years to come!DESIGNED TO GIVE YOU OPTIONS: Our travel toiletry bag can be used to store art supplies, as a lunch bag, baby bag or even for electronic gadgets. With multiple pockets and multiple compartments, you have a wide array of options when it comes to using the bag. Plus, it comes in 7 different colors so that you can choose according to your own personal style!